Phalanx 1B encompasses the range of actions required to assure success and shape the battlespace for naval, joint, and combined forces. The U.S. Navy awarded Raytheon a $159.9 million contract to manufacture, inspect and test Phalanx Close-in Weapon Systems. The contract, which provides for a $10 million option in fiscal year 2015 and another valued at $291 million in fiscal 2016, includes support equipment for the Phalanx and SeaRAM Weapon Systems, Block 1B radar upgrades and kits for reliability, maintainability, and availability. The contract also covers overhaul of four Land-based Phalanx Weapon Systems. Work under the contract, which was signed in the third quarter of 2015, is expected to be completed by August 2018 in Louisville, Kentucky. This contract was announced by the Department of Defense on September, 30, 2015. Phalanx is a rapid-fire, computer-controlled radar and 20 mm gun system that automatically acquires, tracks and destroys enemy threats that have penetrated all other ship defense systems. More than 890 systems have been built and deployed in navies around the world. 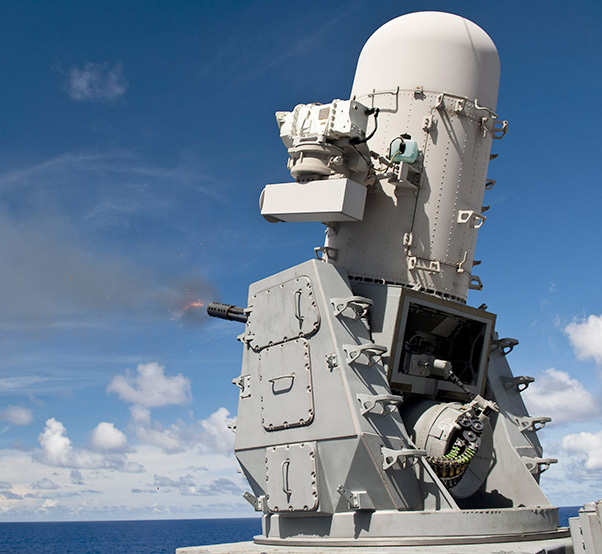 Intended to enlarge Phalanx’s keep-out range against evolving anti-ship missiles, rotary- and fixed-wing aircraft and other threats, SeaRAM Anti-ship Missile Defense Systems use advanced Phalanx Block 1B sensors and replaces the gun with an 11-round Rolling Airframe Missile guide. SeaRAM is aboard the Independence-class of the U.S. Navy’s Littoral Combat Ships.